For over 1000 years the salt marshes close to the medieval town of Guerande on the French Atlantic Coast have been known for producing the best and purest salt in the world. This area of Brittany has the ideal combination of sun, wind and lowland marshes to allow for the evaporation of the nutrient rich waters of the Bay of Biscay. Here the salt farmer, or Paludier, still cultivates by hand using special wooden rakes and on just a few days each summer when conditions are just right and a white “bloom” will appear on the water, they harvest the “fleur.” This is the lightest of the salts with a rich and pleasant mineral taste that is so coveted by chefs around the world. More a condiment than table salt, bring your foods to new heights with a finishing sprinkle on all meats, fish and poultry, vegetables and over all salads. Keep the Fleur De Sel in our KATZ OLIVE WOOD SALT KEEPER when not in use to preserve its moisture. 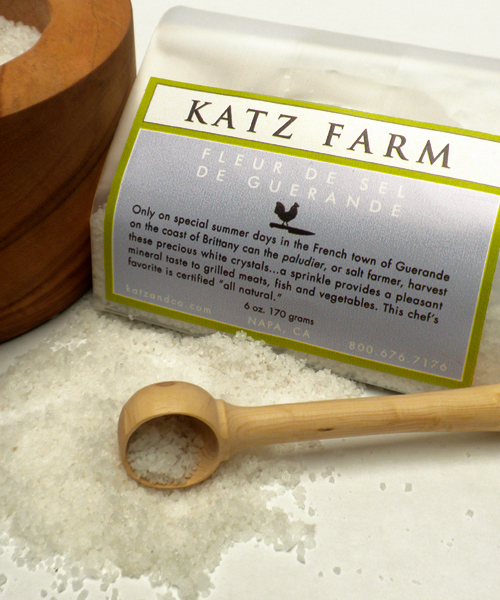 KATZ Guerande Fleur De Sel is certified “All Natural,” and it also is KOSHER CERTIFIED!